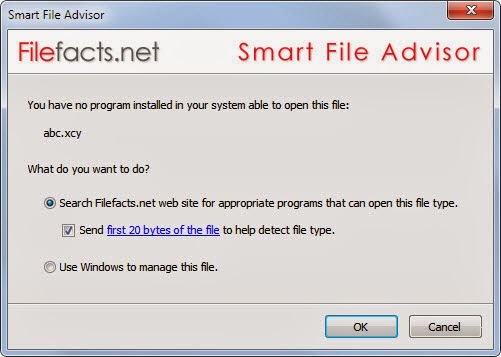 If you had come to this page, you are more likely than not to have installed a perfectly legit software which had bundled with this software known as "Smart File Advisor" also known as SFA. One known one is Alcohol 52% FE. And this is where the real danger lies in. In theory (if it had not already been taking places) is that whenever you try to download a file, it would poll that php scripts and it CAN do really bad things like redirecting you to another file instead (and renaming it to be your original - Its not even hard), make you run some scripts which captures information form your PC, insert codes into your return pages which can do almost anything a page can do and more. In short. SPYWARE. And its not just me doing all the bullshiting here! Even AVG backs me by flagging SFA as a virus! So, if I have convince you to uninstall SFA. Good. But this is just the point where you find that if you try to uninstall it from the Add/Remove or "Programs and Features" (in Windows 8), you will either find that SFA will threaten to remove your other software as well and most likely it will fail to uninstall anyway. So, is there a uninstaller? Yes, but after looking through the page I found, I find the "uninstaller" rather fishy by itself too, so I really won't recommend it. So, let's do it manually. You will need to make sure you close the stupid SFA program from the tray and in memory (Task Manager). Then you will need to perform the following which involve deleting of a folder (usually just 1, 32 or 64 bits). And then you will need to remove some registry entries away. I had it packed into a reg file for you to cut and paste into your editor and save it. as the most dangerous thing SFA does, but you don't touch that registry entry in your script. What should the entry look like normally, pre-SFA? You should not need to touch the file association. Once SFA is gone, it stop to mess around with the file association and your defined programs should handles those files DIRECTLY without going through SFA or the Php scripts anymore. I think SFA is spyware. SFA downloaded a virus that Malwarebytes quarantined. I used the SFA uninstaller and, hopefully, it removed itself. I checked the registry entries mentioned in this Blog and those entries aren't there anymore. Only time will tell if SFA is still lurking somewhere on my computer.